We’ve all heard the saying that the best things in life are free. But did anyone ever tell you what they are and where you can find out about them? 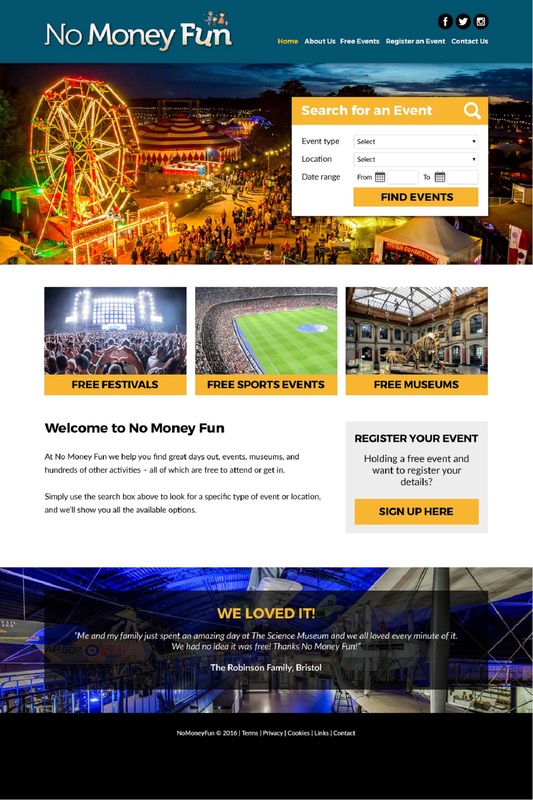 With No Money Fun we want to bring together all the days out, music gigs, village fairs, museums, nature trails and summer festivals, and put them under one roof for everyone to know about and enjoy. But, with one key selling point – they all should all be free to get in. There are many ‘what’s on’ services out there, and some include free things, but nobody is focusing exclusively on ‘no money fun’. The site will be a unique portal that allows people to search and find free events, activities and things to do, based on their location. The model is that No Money Fun will be free to consumers and free for event holders to post their listing. Who are we and where did the idea come from? My name is Adrian Beale, and during the day I am Co-Founder, and Sales & Marketing Director of a speciality food importing and distribution business based just outside Bath, UK. We source products from across the UK, Ireland and the US, and supply retailers such as delis, farm shops and supermarkets in the UK, Europe, the Middle East and Far East. I have been in sales for over 20 years and have recently started giving talks to small food producers on how to sell, how to deal with buyers, and the importance of great packaging. During this time my business employed the services of a local marketing company, where I met and become good friends with my partner for this project. 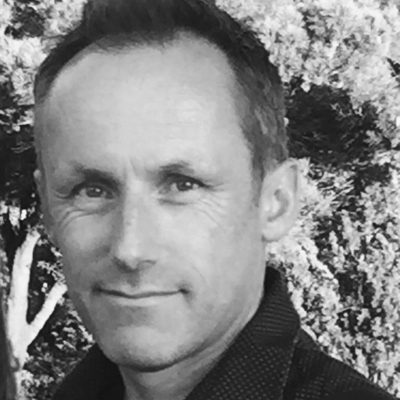 Neil Wilkins MCIM FCMC BSc (hons) is the Founder and Managing Director of Viper Marketing a marketing and communications company based in Bristol, UK with offices in Egypt and Dubai. He is also Founder and a Director of Venturity, a business that supports start-ups and high growth companies with strategy, marketing and finance. He is a member of the Chartered Institute of Marketing and Fellow of Cambridge Marketing College. 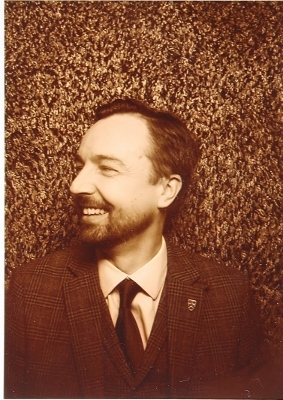 With a degree in Psychology, Neil has thirty years marketing experience in a range of industries including telecoms, manufacturing, consumer products and financial services. Neil launched his first website in 1994 and has been actively involved at the forefront of digital strategy, marketing and communications ever since. A published author, he regularly speaks at conferences and events on the importance of strategy, planning, the customer journey and digital marketing. The idea for No Money Fun came to me a couple of years back I received a phone call from a good friend informing me that he and his wife were having their first child. After congratulating him and wishing them all the best, I imagined myself in the same situation and wondered how on earth you keep a child entertained for the best part of 18 years. You can probably guess that I don’t have children myself, given that my thoughts immediately turned to how best to keep them quiet. The thought stayed with me though, so later that day I searched for ‘fun things to do for free’ near where I live, and was surprised to find that very little seemed to be going on, or, in my opinion, sounded fun. Or free. The sites that did post free events didn’t look up to date, and the sites that looked fun still listed (and heavily promoted) events that weren’t free. Running the idea of a dedicated ‘free (fun) things to do’ website past a few friends confirmed that there was indeed a demand, and a simple shortening of the search term I used gave me the name. Many evenings and weekends later has lead me to the point where hopefully, with your help, we can make it real. 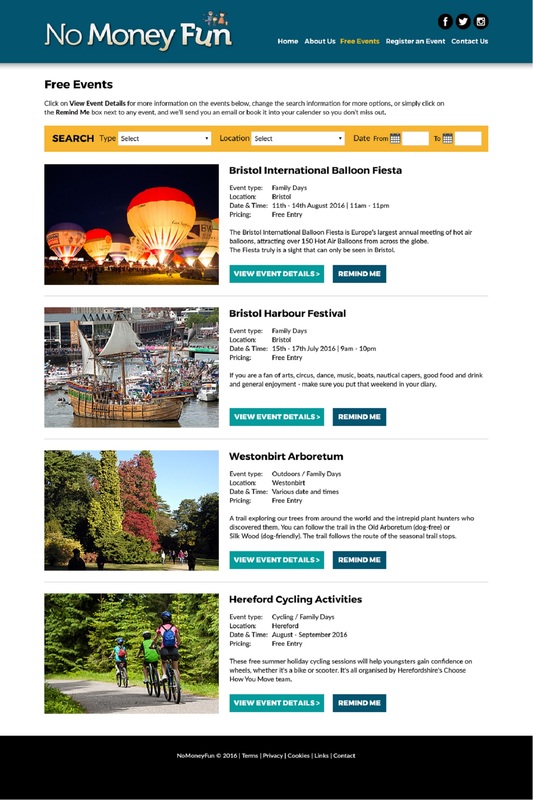 We have mocked up a design and template for how we think the site will look, but we are also working to a short set of guidelines to ensure the site will always be simple to navigate and easy for both ‘locals’ as well as visitors to the UK. You’ll have heard us mention in the video that we also have plans for features such as 'Remind Me'; where the site can let you know about something coming up in the future that you’d like to go to, and 'I’m Off! '; where at the click of a button you can let your social network know where you're going. Page 3 - a more detailed page specific to the event you've selected. 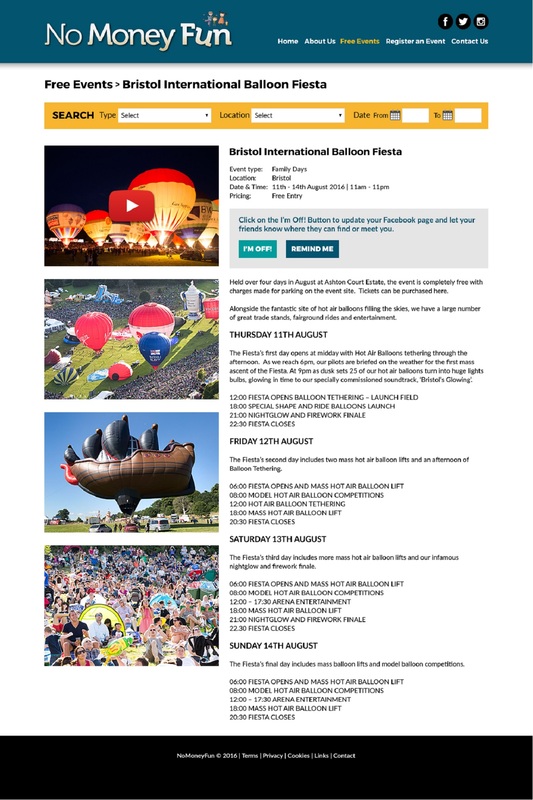 In this case - the Bristol International Balloon Fiesta. Page 4. 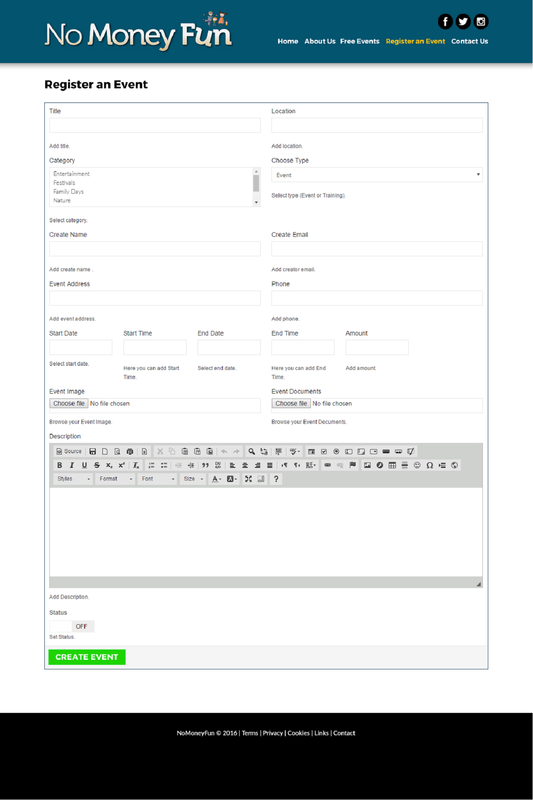 This is an example layout of the page where a host enters their event details and then uploads it to the site. Just under half the funds (£10,000) will go towards the build of the website itself. A local company known to both myself and Neil will be responsible for this, and have an excellent track record. They have been involved in discussions for the last few months and have the skills and expertise to implement all our requirements. The rest of the funds (at around £2k per month) will cover a further 6+ months of development and SEO. Neither myself or Neil will be taking money or salary from the funds raised. We are giving up our own time and have used our own funds to get us this far. Crowd funding is an excellent way of building a community from the very start. The funds are clearly crucial, but we need to build awareness not only to potential users, but also to potential organisers who can host their event on the site. This is where you can help. What's the long term vision? We aim to have No Money Fun sites in every country. The UK is our starting point, but we believe the demand is universal. Firstly, we’d love you to make a pledge, but more importantly we want you to stay involved and remain part of the community. The perks we’re offering reflect our ambition to have as many people be a part of the No Money Fun family as possible. If you are unable to pledge then we completely understand, but please share this with as many people as possible. Here are the links to our current landing page and also our Twitter page. We do hope you'll be able to join us for some No Money Fun in the near future! We have budgeted £10,000 for the programming and build of the website, which will have many custom features, and £2,000 per month for site development and SEO. Our regular day jobs give myself and Neil the experience and expertise necessary to bring this project to fruition on time and on budget. Our long term aim is to have No Money Fun sites in every country. The extra funds will help us fast track this so the whole world can join in the fun! 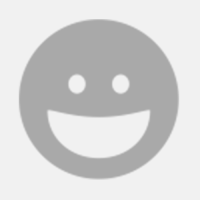 Take a space on our Supporters Wall, dedicated to showing everyone who has kindly supported No Money Fun. We'll grab your Facebook or Twitter profile picture and you'll see yourself alongside everyone else who supported the launch of No Money Fun. You can also join us for a Thank You get together for a coffee and brownie courtesy of our friends at American Kitchen. 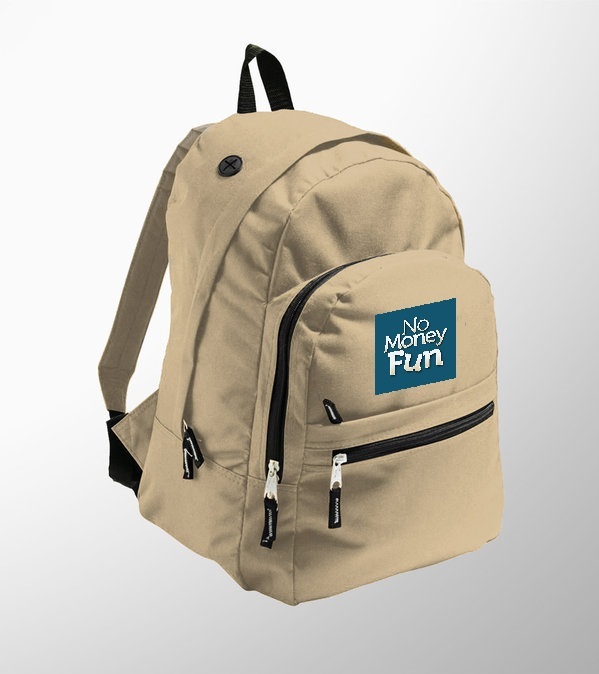 Enjoy your No Money Fun days out and visits with your exclusive No Money Fun Backpack, a high quality, branded bag. Wear your Backpack at events and venues and you'll be in with a chance of winning some exclusive, exciting surprises. It's your ticket to even more FREE fun! We'd love you to also join us in Bristol for a coffee and brownie. Enjoy the role equivalent to an Executive Producer. Along with one of our back packs, we'll give you a VIP access to developments, news and insights into what it's like behind the scenes of No Money Fun. You'll have a profile on the No Money Fun website and recognition as one of the key associates at the launch of the service. We'd also love to say thank you in person, so please come and join us at our Thank You event in Bristol (day and time to be arranged) for a coffee and brownie from American Kitchen, maybe even a slice of Key Lime Pie!